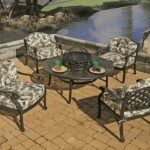 Aluminum patio furniture is the most popular choice today for outdoor living. With rust-free super durability, aluminum can survive blistering summer suns and bolstering storms, as well as energetic children. Lightweight and easy to maneuver it is virtually maintenance free and suitable for use anywhere outside. Many furniture manufacturers and online stores carry various styles of aluminum patio furniture. Although most of the designs are contemporary, you will also find elegant traditional pieces that compliment country and old world style residences. 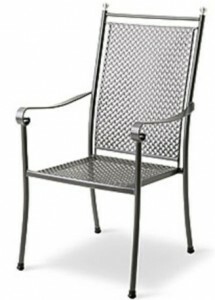 There are three main varieties of aluminum patio furniture – cast, wrought, and tubular. 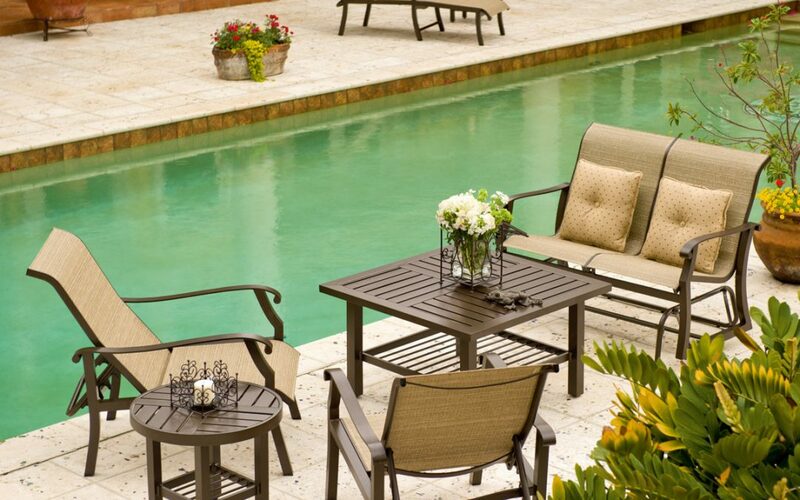 Traditional looking wrought and cast aluminum are popular for both indoor and outdoor furniture, whilst the more contemporary looking tubular aluminum, is mainly used outdoors and poolside. Cast aluminum furniture has the elegant appearance of cast iron without the tedious maintenance required. The elaborate detailing, reminiscent of the 18th century, is achieved by pouring molten aluminum into hand carved casting molds. The result, furniture with a delightful old world charm combined with superior strength. Cast aluminum is sturdy, long lasting and easy to maintain. As it tends to be costly, it probably does not suit the person wanting to redecorate their outdoor room every season. 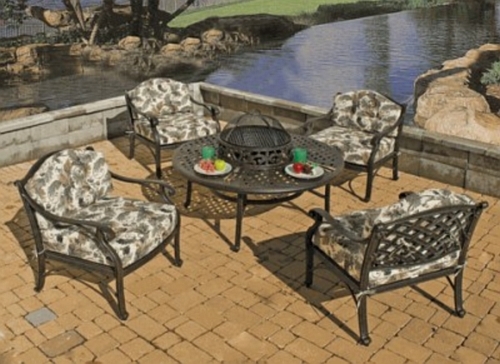 However, if you treat your cast aluminum setting as an investment piece, add great cast furniture cushions,and add to your collection over time, you will have an outdoor room that stands the test of time. Wrought Aluminum furniture blends the old-fashioned art of hand forging, with modern technology and the durability of aluminum. Wrought aluminum furniture has the exquisite detail of wrought iron craftsmanship, integrated into a modern material that is rustproof, lightweight and low maintenance. Most aluminum furniture today is tubular aluminum. Made from cut hollow tubing molded into furniture frames, it has a smooth baked-on powder coating finish. Modern technology has made it possible for tubular aluminum to come in a vast array of exciting finishes. Not only is there a handsome collection of colors to choose from, but also stylish finishes that replicate pewter or stone. The tough and versatile coating does not chip, crack or peel, making it the material of choice for discerning styling. 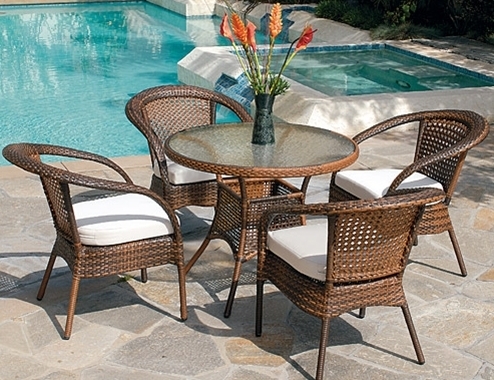 With the variety of frames and straps to choose from it is easy to co-ordinate any outdoor room. In addition, they come in expansive collection of dazzling fabrics that will fashionably highlight your furniture.